Howler monkey is the common name for the tropical, arboreal New World monkeys comprising the genus Alouatta of the primate family Atelidae, characterized by prehensile, thickly furred tails, completely black faces, a stout build, relatively large size, and loud howling calls. Their loud roars can be heard by humans even three miles away through the dense jungle, and they have been called the loudest animals in the New World (Dunn 2008). Aloutata is the only genus in the subfamily Alouattinae. There are ten species of howler monkeys (NPRC), ranging from southern Mexico to northern Argentina (Strier 2004). Other members of Atelidae, but in another subfamily, are the spider monkeys, woolly spider monkeys, and woolly monkeys. Howler monkeys play an important ecological role in the middle of terrestrial food chains, consuming fruit, leaves, flowers, some insects, and other such food while being preyed upon by harpy eagles, jaguars, and other large predators. For humans, they add to the wonder of nature with their unique calls and behaviors. However, various anthropogenic actions, such as habitat destruction and capture for the pet trade or for food, have impacted the populations on howler monkeys. 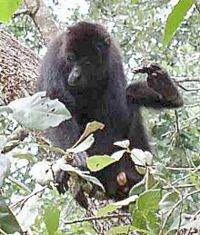 The brown howler monkey (Alouatta guariba) is classified as Vulnerable, while the Coiba Island howler (Alouatta coibensis) is classified as Endangered (Strier 2004). On the other hand, in some localities the removal of top predators, such as the jaguar, have caused too many howler monkeys and consequent disruption of the ecosystems. Howler monkeys are New World monkeys. New World monkeys are one of three major informal groups of the biological order Primates, the other two groups being prosimians in addition to monkeys and apes of the Old World. Together, the New World monkeys and the Old World monkeys and apes are considered to be "higher primates," or simians (infraorder Similformes), while the prosimians (such as lemurs) are considered to be the "lower primates." The term monkey, thus, refers to any simian that is not an ape or any primate that is neither an ape or a prosimian. In reality, monkeys are not a single coherent group and, therefore, do not have any particular traits that they all share. The New World monkeys are found in Mexico, Central America, and South America, and the Old World monkeys are located in Africa, central to southern Asia, Japan, and India. There are four families of New World monkeys: Cebidae, Aotidae, Pitheciidae, and Atelidae (Groves 2001). The four families are ranked together as the Platyrrhini clade. All New World monkeys differ slightly from Old World monkeys in many aspects, the most prominent of which is the nose. This is the feature used most commonly to distinguish between the two groups. The scientific name for New World monkey, Platyrrhini, means "flat nosed," describing their flatter noses, with side facing nostrils, compared to the narrow noses of the Old World monkey. Most New World monkeys have long, often prehensile tails. Many are small, arboreal (live in trees), and nocturnal (active at night). Unlike most Old World monkeys, many New World monkeys form monogamous pairs and show substantial paternal care of young. Howler monkeys comprise the genus Alouatta and belong to the Atelidae family with the spider monkeys (genus Ateles), woolly monkeys (Lagothrix), yellow-tailed woolly monkeys (Oreonax), and the woolly spider monkeys (Brachyteles). 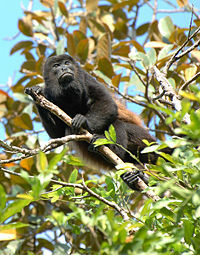 Howler monkeys are placed alone in the Alouattinae subfamily, while the other members of the family belong to the Atelinae subfamily. Howlers are called "congos" in Nicaragua and Costa Rica. In Belize, they are called "baboons," although they are not related to the primate which usually carries that name. Howler monkeys (genus Alouatta) are stoutly built and range in size from 56 to 92 centimeters (22 to 36 inches), excluding their tail, which can be equally as long, ranging from 51 to 89 centimeters (20 to 35 inches) (Strier 2004). Females are much smaller than males (Strier 2004). Like many New World monkeys and all atelids (family Atelidae), howler monkeys have prehensile tails. The first 2 fingers of each hand are set apart and are opposable to the other three. Members of Alouatta have completely black faces (Strier 2004). Howler monkeys have an enlarged hyoid bone, contributing to the long distance calls, and have an elongated gut that is associated with the slow digestion of the plant matter (Strier 2004). Like other members of the family, howler monkeys have 36 teeth, following the dental formula of I 2/2, C 1/1, P 3/3, M 3/3 (Strier 2004). Unlike other New World monkeys, both male and female howler monkeys have trichromatic color vision; that is, they are capable of seeing three colors and all combinations of those colors (Jacobs et al. 1996). Howler monkeys have a lifespan of 15 to 20 years. They are native to South and Central American forests, and even extend into Mexico in North America. They have the widest distribution in the Atelidae family, ranging from southern Mexico to northern Argentina (Strier 2004). Howler monkeys are arboreal, although they have been observed on the ground for brief periods in order to eat, play, drink, and travel (Strier 2004). 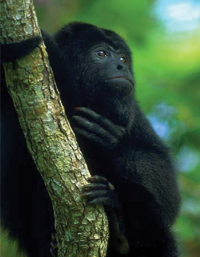 Howler monkeys, by far, are the most folivorous (leaf-eating) of the Atelidae (Strier 2004). Howlers eat mainly top canopy leaves, together with fruit, buds, flowers, and nuts. They need to be careful not to eat too much of certain species of mature leaf in one sitting, as some of the leaves they eat contain toxins that can poison the monkey (Glander 1977). The slow-moving howler monkeys move quadrapedally and do not brachiate, usually holding on to a branch with at least two hands or one hand and the tail at all times. Their prehensile tails are strong enough to support the monkey's entire body weight, although they seldom do so. They very seldom leave the trees. They rest about 80 percent of the time and are considered the least active of all monkeys. Howler monkeys typically live in multifemale, multimale groups, although one male, multifemale groups are also common (Strier 2004). Group size varies by species and by location, with an approximate male to female ratio of a male to four females (Sussman 2003). Unlike most New World monkeys, juveniles of both genders emigrate from their natal groups (Sussman 2003), so neither adult males nor adults females in a group are typically related. In the red howler monkeys (Alouatta seniculus), females may be retained by their natal troops, while males may emigrate in pairs to establish new troops together (Strier 2004). While paternal care is not evident among members of the Atelinae subfamily, howler monkeys comprising the Alouattinae subfamily do exhibit some parental care with male howler monkeys caring infants or positioning themselves between infants and threatening extra-troop males (Strier 2004). Fighting among group members is infrequent and generally of short duration. However, serious injuries can result. Both males and females may fight with each other (Sussman 2003; Crockett 1998). As their name suggests, vocal communication forms an important part of their social behavior. Specifically, their common name comes from their distinctive loud barking whoop they make, which can be heard over considerable distances. (As correctly pointed out by William Henry Hudson in his novel Green Mansions, "howler" is a misnomer since the male's voice sounds rather like a powerful roar; female vocalizations sound like a pig's grunt). They have an enlarged basihyal or hyoid bone that helps them make their loud sound. They are considered the loudest land animal in the New World (Dunn 2008). While some members of the Atelidae family are popular as pets, howler monkeys, while seldom aggressive, do not take well to captivity and are of surly disposition. 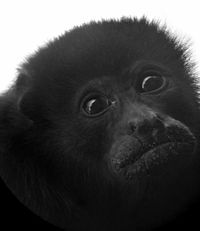 However, the black howler (Alouatta caraya) is a relatively common pet monkey in contemporary Argentina due to its gentle nature, in comparison to the capuchin monkey's aggressive tendencies (in spite of its lesser intelligence as well as the liabilities in the way of the size of its droppings and the males' loud vocalization). Alexander von Humboldt said about howler monkeys that "their eyes, voice, and gait are indicative of melancholy," while John Lloyd Stephens described those at the Maya ruins of Copán as "grave and solemn as if officiating as the guardians of consecrated ground." To the Mayas of the Classic Period, they were the divine patrons of the artisans, especially scribes and sculptors. Copan in particular is famous for its representations of Howler Monkey Gods. Two howler monkey brothers play a role in the sixteenth century myth of the Maya Hero Twins included in the Popol Vuh. ↑ C. Groves, "Order Primates," "Order Monotremata," (and select other orders). Page(s) 148-152 in D. E. Wilson and D. M. Reeder, eds., Mammal Species of the World, 3rd edition, Johns Hopkins University Press (2005). ISBN 0801882214. Crockett. 1998. Family feuds. In R. L. Ciochon and R. A. Nisbett, The Primate Anthology: Essays on Primate Behavior, Ecology, and Conservation from Natural History. Upper Saddle River, N.J.: Prentice Hall. ISBN 9780136138457. Dunn, T. 2008. Small mammals: The brown howler monkey. The loudest animal in the New World. Smithsonian National Zoological Park. Retrieved June 9, 2008. Glander, K. E. 1977. Poison in a monkey's Garden of Eden. Natural History 86: 146-151. Jacobs, G. H., M. Neitz, J. F. Deegan, and J. Neitz. 1996. Trichromatic color vision in New World monkeys. Nature 382: 156-158. National Primate Research Center (NPRC). 2008. Howler monkey Alouatta sp.. Primate Info Net, National Primate Research Center, University of Wisconsin-Madison. Retrieved June 9, 2008. Streier, K.B. 2004. Howler monkeys and spider monkeys. Pages 155-170 in B. Grzimek, S. F. Craig, D. A. Thoney, N. Schlager, and M. Hutchins. Grzimek's Animal Life Encyclopedia, Volume 14 (Mammals III). Detroit, MI: Thomson/Gale. ISBN 0787657891. Sussman, R. W. 2003. Primate Ecology and Social Structure, Vol. 2: New World Monkeys. Pearson Prentice Hall. ISBN 0536743649. Black Howler Monkey from Belize Zoo (photos, video and audio included). This page was last modified on 15 January 2018, at 17:44.